Sardinia is the second largest island in the Mediterranean Sea, between Italy, France and Tunisia, south of Corsica. It was called "Ichnusa" by the Phoenicians and "Sandalyon" by the Greeks because of its shape, like a footprint. 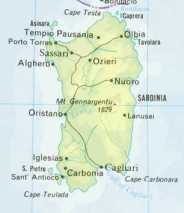 Sardinia is divided into four provinces: Cagliari, Sassari, Nuoro and Oristano; another four provinces have been proposed: Olbia-Tempio, Ogliastra, Carbonia-Iglesias and Medio Campidano, to take effect in 2005. The official language of Sardinia is Italian but Sardinian, a Romance language with Phoenician, Etruscan, and Near Eastern roots also widely spoken. Many other dialects, like Gallura and Sassari, a variety of Corsican-Italian, Ligurian, and Catalan also spoken on the Sardinia and the neighbouring islands. Hui Chin and I visited Sardinia during our trip in 2004. We sailed on a fast ferry from Bonifacio in Corsica, to Santa Teresa on the northern coast of Sardinia. Santa Teresa is a very colourful, quaint little town. Most of the towns houses are painted in many different pastel colours, not unlike southern, rural Spain. After taking time out to explore Santa Teresa and the surrounding area with went by bus to Olbia, where we, - after a good look around - caught a train to Calgiari, the Capital of Sardinia at the southern end of Sardinia. Calgiari is a very beautiful large city, with some hills and fortresses around. There was some "Veteran's Reunion" at the time, which made the town that much more colourful and exciting and hotels hard to find.